PLEASE DO NOT USE THIS SECTION FOR GENERAL POSTINGS! Now there is a detail never seen before, and mostly un-noticed in life. The tree stumps from clearance work, and the discoloured patch from beneath the tree or bush. Had a bit of a play time over the weekend. There were a few maintenance tasks which needed attending to. The main thrust was to sort out electrical connections that had failed over the winter. One point motor was brought back into service and a couple of sections of track. Trains wise, things were running well. Helped by the servicing of much of my fleet got over the winter ready for last months show. I was pleased that a couple of old Lima Class 66's ran without the need for attention. One longstanding issue I managed to resolve was a coach that kept riding up and derailing. 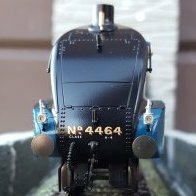 It is part of a permanently coupled set, so it was a pain to un couple to work on, so I had been ignoring it for a year or 3. On close inspection I noticed that busy wasn't siting snug to the under frame. I pulled it all apart and the metal weight was not sitting right. Careful alignment of everything and it all went back together snuggly and the derailing is no longer and issue. I have now shown some hobby colleagues the picture and now knows what bell crank etc. in German means. What Google Translator offered as translations was not effective. Because it is also my goal to let one central locking drive make the switching of to points with such a linkage. To be honest, I had the tunnel portals up to a long time ago, which I brought back from Italy. I just built them up and gave the mountain a first shape with construction foam.